Apple Pie Granitas provide the flavors of fall in a cool summer treat. School has started. Some leaves are turning and even falling from the trees. The inevitable shift of seasons has begun ... except that it is still gloriously, sun-shiny warm. Almost hot. OK, definitely hot. 99 degrees and the air heavy with humidity hot. Hold the pumpkin; it’s still summer. This secretly pleases me. (Well, not so secretly. I think I have mentioned it almost every time autumn approaches). I will be shivering in 30 below wind chills soon enough. Let the sun hang on and warm the days awhile longer. Let it be hot. Let it be summer. I won't complain. 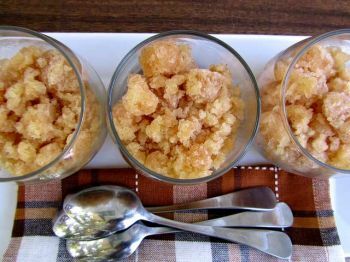 I may hold off on the pumpkin for a while, but will give a nod to the changing seasons with some Apple Pie Granita. It is all the flavor of autumn in a refreshingly cool and icy dessert. Call it an autumn take on a summer snow cone. Perfect for almost 100 degree temperatures in September. In a saucepan, combine all of the ingredients and cook over low heat, stirring, until sugar has dissolved. Pour into an 8-inch square glass baking dish. Freeze until icy around the edges, about 1 hour. Using a fork, scrape the icy shards into the center. Continue to freeze, stirring occasionally, until slushy throughout, about 3 hours.